New ListingNick The Pickford Brass Button Disco Bear Complete With Tags and Stand 11"
0 bidsEnding Wednesday at 23:44 EDT1d 5hSize: 10in. 1999 Brass Button Bear Hippie Flower Child IVY 12"
Have a look around my store for more teddy bears. Made in 1999. She comes with plastic doll stand. Measures approx. 12" tall. Please Read :Payment: I accept Paypal only and payments are due within 3 days after winning the bid. Roxy 1980's Brass Button 20th Century collectable Bear ,Real Valley Girl. 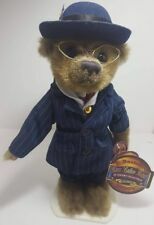 Have a look around my store for more teddy bears. Love wearing a genuine rose quartz necklace( you can wear as braclet) If you would prefer a box let me know before paying for your item and I will send a revised invoice. 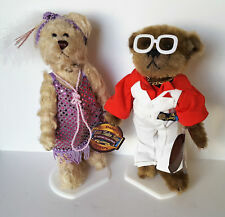 Pickford Bears ,Missy Tennis Player Brass Button Bear 2001. Pickford Bears Ltd. Brass Button Pendant Bears. With Genuine Ruby Necklace. 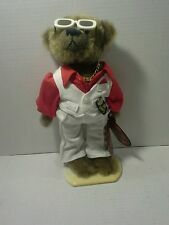 Pickford Bears Brass Button Collection DAISY Bear. 1920's flapper with dress, pearls, and headband. INCLUDES RARE ORIGINAL STAND! Manufactured in 1996, “Tully” is one eight collectible good luck bears, and is the bear of joy. Dressed in a navy knit sweater and sporting a red and navy baseball cap, he will bring joy to all who possess him. This is a great bear in new condition, but she is missing her tags. She has poseable arms and legs and is dressed in a patriotic outfit. Paypal is the only accepted payment method. If you win more than one auction, please send me a message and I will send you an amended shipping invoice. Happy Bidding! Ending 28 Apr at 3:03 EDT4d 9hSize: 11in. 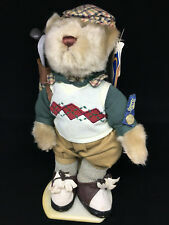 The Pickford Collection 2001sports Bear Ginger with jump Ski board. Art line Sculptural Garden BL3614 Mama bear and baby bear, Black statues.